Greenpeace offices in Italy and New Zealand tested direct response television (often referred to as DRTV) to reac new audiences. Email response rates got you down? 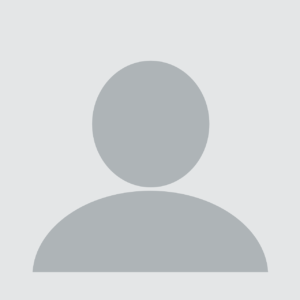 Online petitions not reaching new people? Looking to talk to new people that are busy at home — but may have a TV on and a phone or tablet in their hand)? Greenpeace offices in Italy and New Zealand tested direct response television (often referred to as DRTV) as a way to scale outreach to new audiences and extend email, web and social media marketing. DRTV has been around for years and is a mature marketing approach for retail brands and other companies in Europe, the U.S. and elsewhere. A DRTV ad includes a call to action asking viewers make a phone call, visit a website or send a text. DRTV can reach a broad audience, though one still targeted by the time, channel and TV market. Two years separated DRTV tests in Italy and New Zealand but both began with a video titled “Paula Bear” that includes a Jude Law voiceover and Radiohead’s music in the background (see video to right). In New Zealand, as described below, the team used the DRTV video as the focal point for an email crowdfunding campaign. The 2014 Italy test included a new 2 step DRTV ad developed by a consulting partner. Both videos used strong emotions to engage viewers and asked them to send an SMS to become a monthly donor and support Save the Arctic. In Italy, the Paula Bear video had a higher conversion rate (people responding and contacted were more likely to donate). But the new video had a far higher response rate. 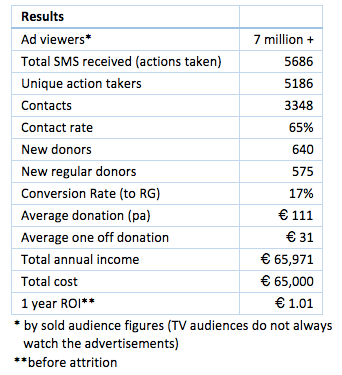 Greenpeace Italy’s DRTV tests were intended to measure response and donation rates to different styles of DRTV ads. Along the way, the project also tested the group’s ability to work together on a large, integrated fundraising and outreach project. Producing DRTV is a significant lift for NGOs. 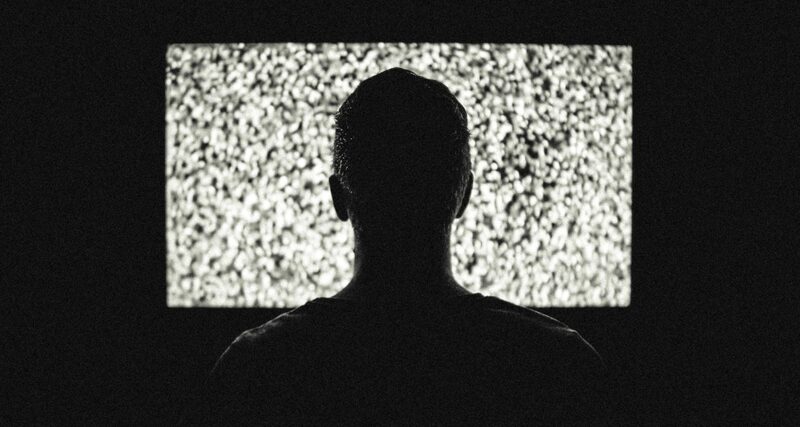 There are a lot of moving parts that few organisations frequently manage or use: high quality creative video, experience with SMS, web and other response systems, and, of course, expense (TV time can be, but isn’t always, expensive). Why bother in an age where email and social media are proven outreach tactics? A good DRTV campaign can expand awareness in ways that aren’t possible with standalone email or social media projects, both of which limit viewership to subscribers or fans/followers. DRTV helps an organisation get at a new audience, lifting awareness of all campaigns, not just the primary campaign. DRTV also provides an opportunity to reach new supporters, including donors, in the comfort of their own homes. The ubiquity of smartphones and other mobile devices means that viewers can respond immediately by text. 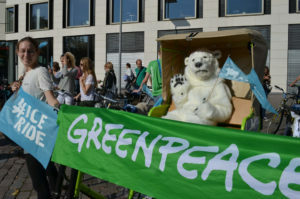 In the 2014 Italy test, every respondent was called and updated on the campaign, giving Greenpeace Italy a chance to engage one on one with each new supporter. DRTV can be a significant investment in a single communications product. It’s creation allows an organisation to think carefully about message. DRTV can deliver a uniform message to large numbers of people without facing a sometimes hostile media lens. DRTV can reach audiences who may not otherwise hear from the organisation. Viewers don’t need to be subscribers or website visitors. Viewers can respond to DRTV with text messages, facilitating high quality data collection that improves follow-up compared to collecting email addresses. DRTV and other other channels (email, social media and web) can complement one another, as they did in Greenpeace New Zealand’s Paula Bear DRTV project. The video (see below) was first shown online in early-July, 2012. Later that month, Greenpeace New Zealand began a campaign to crowfund placement of the video on TV. Staff chose to wait until the video had been out for a few weeks before going to the email list. 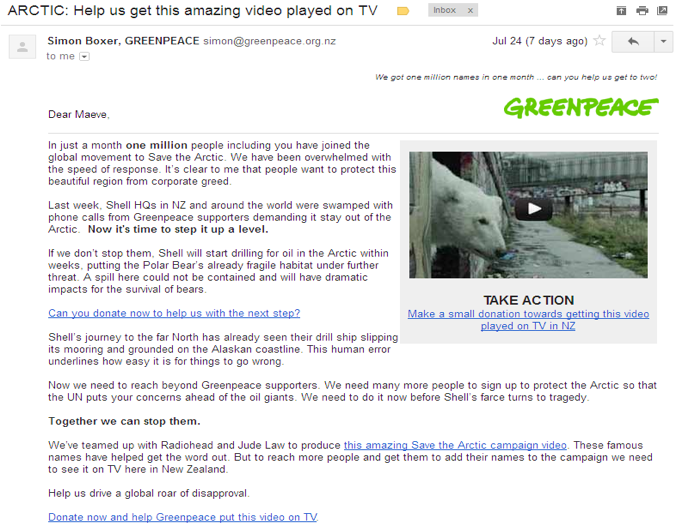 Email sent by Greenpeace New Zealand to crowdfund the Paula Bear video as a TV ad. Media coverage of the video and social media sharing is credited for higher awareness that helped two email appeals raised just under $25,000. The Paula Bear video was emotionally charged – perhaps best described as heart-wrenching. Staff also point to the emotional nature of the video as contributing to its success. The Paula Bear video ran on New Zealand television stations after the funding stage. 14,500 people signed a Save the Arctic petition and 8,800 names were added to the Greenpeace New Zealand database. In addition, 275 new donors signed up to make monthly donations averaging $27.69. When Greenpeace Italy chose to test DRTV last year as part of its Save the Arctic campaign, they put their fundraising and mobilisation teams alongside members of Greenpeace International’s First Engagement team and Rob Patmore, a television fundraising specialist and consultant. Patmore’s first question, he told us, when asked to assist with the DRTV campaign was “has anything worked before?” Greenepeace New Zealand’s Paula Bear video had already worked as a TV ad for Save the Arctic so Greenpeace Italy used it as their control. “Paula Bear worked in New Zealand. It’s an emotional video so it would be crazy not to use that in our test,” said Patmore. The team wanted to learn something so they chose to create a more traditional DRTV ad to run alongside Paula Bear. A comparison of two DRTV ad campaigns tested by Greenpeace Italy. Greenpeace Italy took Patmore’s advice and created an original 2 step DRTV ad to emotionally engage viewers while letting them clearly see the problem and solution. The ad Patmore helped Greenpeace Italy create was much different than the Paula Bear video. As mentioned, and detailed in the chart above, the Paula Bear DRTV ad had a higher conversion rate but the SMS response rate for the new Save the Arctic ad was much higher — each TV spot produced more than three times as many leads as Paula Bear. Each lead was an actual person that could be engaged around the campaign whether they became a donor or not. The new ad (watch it below with an English-language voiceover) led to nearly three times as much pledged income from new donors. It can be difficult to get DRTV right. The experience and skills needed to pull together the creative, media buying, call handling and technical links between suppliers aren’t found inside Greenpeace NROs or country offices. TV advertising is expensive — mistakes in any one of these areas are can be costly, especially for an NGO. Maeve Doherty’s work with DRTV at Greenpeace New Zealand helped inform and integrate internal fundraising and mobilisation teams. Doherty and others noted that one prerequisite for a successful DRTV campaign is having good external partners. In addition to Rob Patmore’s support, Greenpeace Italy had a strong existing relationship with a call agency. The media agency used, StarCom, also had past experience with DRTV campaigns. Overall DRTV test results from Greenpeace Italy. Since Italy’s encouraging test run of DRTV, the team is now sharing their experience, hoping to encourage more Greenpeace teams around the world to use DRTV as an engagement tool. They will continue testing and work with Greenpeace International to write a 2015 DRTV plan. Greenpeace International will continue to do their part to promote DRTV with strong emphasis on seeking support from specialists. They’ve also written a guide aimed at helping other Greenpeace offices determine if their market is right for DRTV.